Advances in technology and introductions of new lifts, wheelchairs, mobility scooters and a wide array of mobility products has resulted in the vast improvement in the mobility of this population and as a result a much better quality of life. Emotionally and psychologically it means a great deal to be independent and mobile. Brella Bag Hands Free Umbrella Holder gives them the ability to steer their wheelchair or scooter or push a walker while having an umbrella overhead. 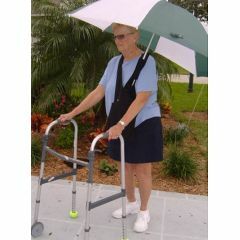 They can walk with a cane or on crutches while their umbrella is solidly tucked into the Brella Bag therefore giving them the “hands free” ability to be protected from the sun or the rain. The unique umbrella holder the Brella Bag has been designed and crafted with care and thought. It is light weight, made of polyester, yet strong enough to hold most sizes of umbrellas steady. 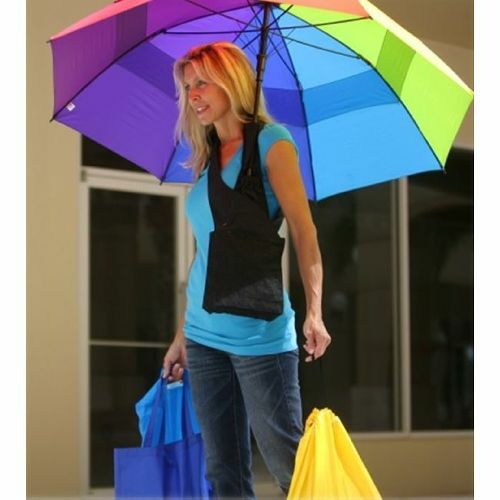 A sturdy pouch on the bag holds an umbrella so that the user’s hands are free. As a bonus the bag is large enough to comfortably accommodate your essential items such as wallet, cell phone, keys, a book and other such things. The Brella Bag Hands Free Umbrella Holder is a convenient solution for disabled individuals, giving them back their independence. Since 1997 Allegro Medical has been a leading supplier of assisted living suppliers and equipment to healthcare providers and consumers. 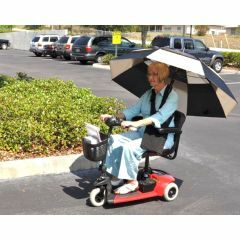 If you are looking to make daily tasks easier with helpful ADL items, rely on AllegroMedical.com for all of your needs. Dan works in Product Management at Allegro Medical with a focus on providing new and empowering products that help customers improve their quality of life.